No, I am absolutely not impatient. No siree. But I don't blame our dear developers even though 0.7.3 ain't ready yet. There are reasons for that, and the game continues improving anyway, but there aren't any good reasons for me to let a whole month and more pass by before writing any news here. So you can verbally slap me with trouts and other sea creatures as much as you like. But the less aquatic of you are probably impatiently waiting for the news, so let's get on with the showcase. Speaking about sea creatures: the above is a new track. A new spin on an old track, one might say, as it's aptly named 'Subsea'. However, it's completely made from scratch by Rudy, with several possible routes featuring ships, sea monsters and other things that makes your mouth water. The landsharks will be happy to know that you're inside tubes, so for the most part, you won't get your proverbial feet wet. Thunderbird debuts as a start referee, with the heavy burden of a traffic light (normally, he deals with mail, I believe). Remember, red means "Hold it", yellow means "Start the race already" and green means "Step on it! ", no matter if it's pedals or your keyboard. Thunderbird plays the traffic warden with style, and gracefully rescues you as well in case of "accidents". Thanks to Kinsu for the model and animaton, and fraag for its texture. You may wonder what the tires are there for. Well, they show your current amount of lives, and if you lose a life, you lose a tire. The last life is represented by your normal tires, so when you (or preferably your foe) are eliminated, you lose your 4 regular wheels! Awesome, innit? :D Thanks a lot to both Auria and new contributor khonkortisan for making this possible. In item news, the bouncer should now work mostly as intended, but we're looking for another model for it which captures the idea of bouncing better. So if you want to give it a shot we'd be happy to hear your suggestions and see your work. 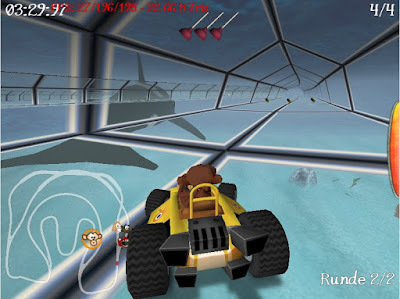 The bubble gum behaviour has changed a little, so instead of stopping in an instant, you get slowed down rapidly and leave a pink trail after you, while losing some control of your kart. Also, the bomb gives now an audible tick-tock sound, so you can hear if someone with a bomb approaches from behind, and take the necessary steps to avoid it. But don't hit the bomb kart with a swatter, since that will trigger the bomb and both will explode. Misc: A better rescue system is now in place, but so far it's been largely untested. It should be much better in some situations now, which will hopefully help remove some player frustration. The physics has been tweaked to work better with tall karts, and it should be quite notable on certain karts (e.g. Adiumy). You can now see how far you've progressed in a Grand Prix, thanks to new contributor Termina1. Conflicts in keyboard configurations are now marked in blue thanks to new contributor redskull. The exporters for Blender 2.59+ has gotten considerably faster and also better in terms of documentation in the STK Blender panels. 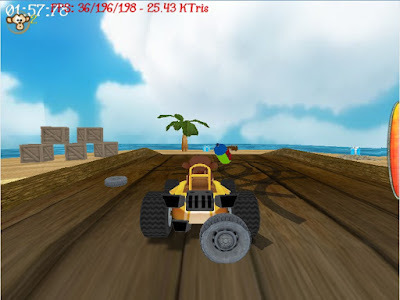 As you might have noticed, there are a few new contributors submitting patches for various parts of SuperTuxKart, and this is highly valued as such contributions often provide the extra little feel of professionalism to a game. If you're a budding programmer, why don't you take a look in our bug tracker and see if there's anything you can help out with? Any help on closing the dozens of bug reports that are in circulation is much welcomed. Or, if you want to work on something else, that's awesome as well, but please drop us a line and tell us what you're working on, in order to prevent duplication of efforts. 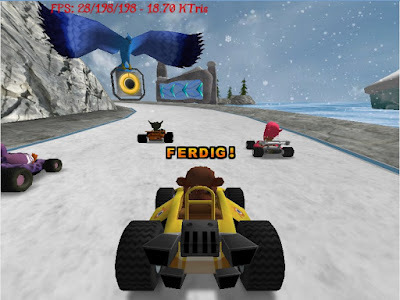 Too bad Gooey be replaced, I liked this kart: (, it would have been nice to add but to keep suzanne Gooey. In stk0.7.3.will be 2 new Items, or? Will stk get a WLan Mode sometimes? Auria, Thanks for your reply, I forgot to add-ons, more than wait, especially since I'm impatient. When does exsist AI for Battle Mode? 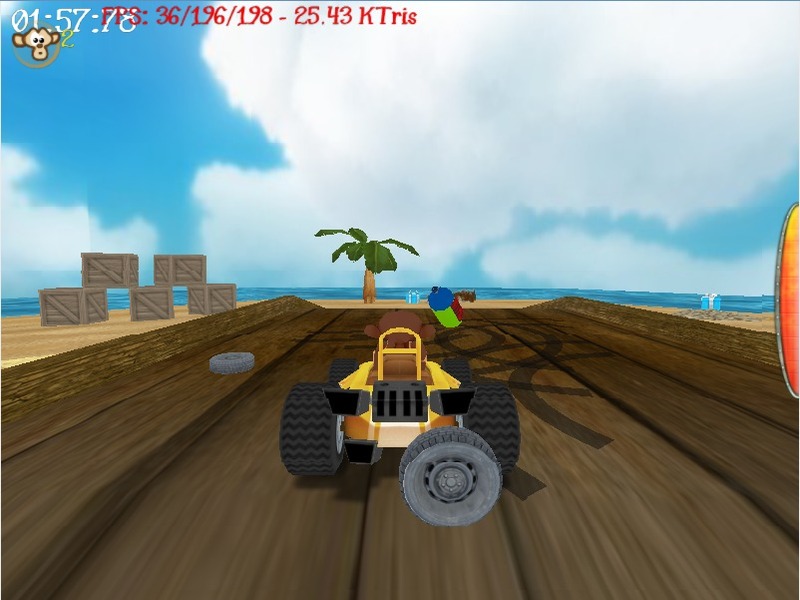 In STK 0.6, there was a race track called "Beach" (name of the Portuguese version). Is there any chance this track to be included in the new version of the game? Thank you for your attention and sorry for terrible english. When will it come out??????????????? Do you have something more concrete than "soon?" :) Is there a way to download build packages? looking forward to this. Anonymous & nick: As I am not one of the programmers, I can only make guesses based on my conversations with Auria and hiker. But it seems very close now, so within a couple weeks should not be too far off. There will be one release candidate before the actual release as well, so the final release also depends on whether we get any high-priority bug reports or not. We don't officially release in-development packages other than alpha/beta/release candidates, but as the code is open you can fetch it anytime from SVN and build it yourself. Also, we have a community member who sometimes makes builds from SVN, but there aren't any recent ones I think. Nice little update. Do have one question, and it has been asked by someone else...is there any news on a WLAN mode?, this would top STK off completley! My kids and I play this game on Windows and Linux all the time. Hurry with the networked version, so I can race my kids and lose! Keep it up, great game! will it come out this week??????????? Can somebody make videos fromm the new STK and does it in youtube ,please. Thank you! will it come today or tomorrow? The children are delighted, wonderful game. Thanks.